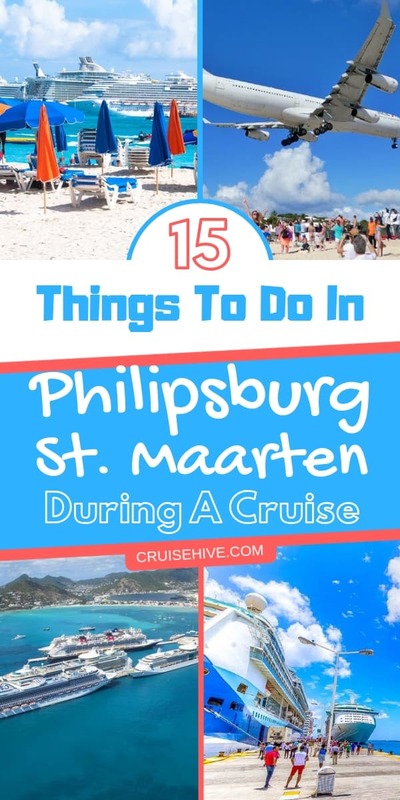 On a cruise vacation in the eastern Caribbean, you're likely to spend time in Philipsburg, St.Maarten so let's take a look at some of the best things to do. European sophistication meets the warm laid-back nature of the Caribbean in the small and beautiful island of St. Maarten. This popular destination in the eastern Caribbean is found in the lesser Antilles Archipelago. We love this cruise destination so much we won’t just be covering things to do in Philipsburg, St. Maarten on the Dutch side but also some awesome things on the French side too! 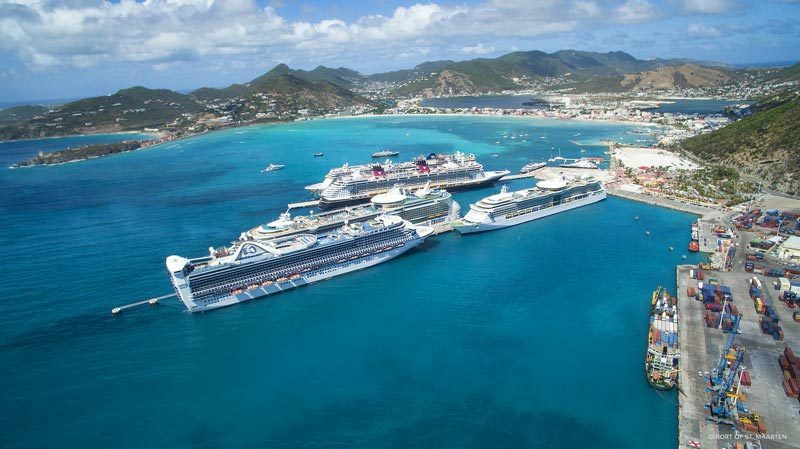 St. Maarten is a world record holder for being the smallest island in the world to host two nations. Sint Maarten as called by the Dutch and St. Martin by the French, is a 37 sq mile island that features all the charm of the Caribbean. The island has gorgeous powdery sand beaches, charming European-style towns and green rolling hills in its backdrop. On top of that, it’s home to a variety of plants and animal species including the largest collection of butterflies in the Caribbean. All this combined with the varying cultures of its inhabitants makes it the perfect cruise destination in the Antilles. When cruising to St. Maarten, you will get to enjoy both cultures and traditions of the Dutch and French as you freely cross the border between these two nations living side by side on the island. To start with, you will enjoy docking at St. Maarten as tendering is not necessary. 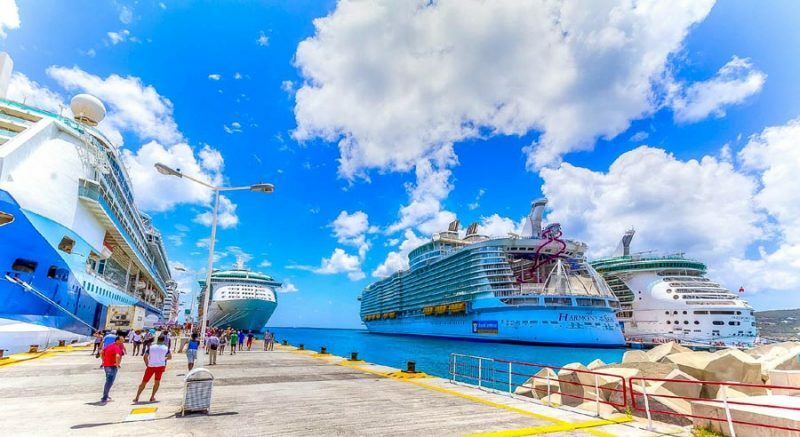 Your ship will dock on the Dutch side of the island at Philipsburg, where all large vessels such as cruise ships dock. Docking at the island is smooth, courtesy of the large pier that accommodates up to 7 ships. Don’t be alarmed, however, as you will rarely dock with 6 other ships. And even if it happens, the island has plenty of attractions which helps spread out the masses. To get around the island you will need a vehicle and luckily transport is readily available at the end of the short pier. There are water taxis, vehicles, trams, buses and even ATV’s at the transport stand. Getting a taxi, rented vehicle or any other means of transportation is easy in St. Maarten. And best of all the taxi charges are standardized by the government. Just walk up to the transport booth at the end of the pier and choose from a number of choices availed to you. 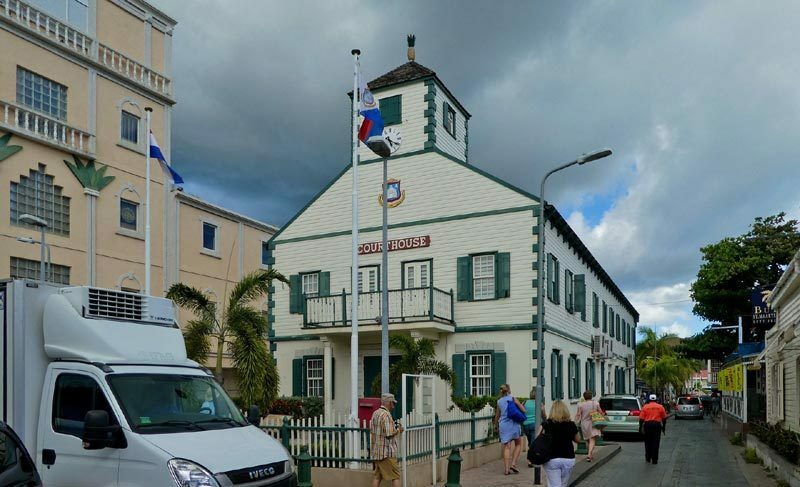 Before taking a taxi tour of the island, it’s best to start with a brief walking tour of the nearby town of Philipsburg. It takes one 10-20 minutes to get to the heart of the colorful town of Philipsburg located 1 mile away from the pier. You can do this by taking a scenic walk on the Philipsburg boardwalk or go sightseeing and window-shopping on the waterfront street a block behind the boardwalk. Phillipsburg has a lot of Dutch charm to offer and there is always a festive mood on their end of the island. Enjoy shopping beautiful jewelry, sampling exotic rum drinks made from rare guava berries or hit the Casinos and try your luck. Let the rich aroma of Caribbean cuisines guide you to an eatery, and grab a quick bite, before getting on with the rest of the day’s activities. You can buy all your St. Maarten souvenirs from Amazon by going here. Downtown is a hive of activity and a major part of that are the small electronic stores. You’ll often find crew members buying there new phones and devices as the price can be much lower than in the U.S. The first beach you will come across on the island is Great Bay beach which is readily accessible from the boardwalk. You can choose to stop here, just relax, splash a bit and take in the views of the gorgeous island. However, if you are a more adventurous soul, there is much to see and do in both the Dutch and French side. So, get to the port early to have the best of the two places. A quick tour of the island with all its highlights is the best way to explore St. Maarten. The tour can be done through a boat excursion around the island’s coastline with brief stops in major tourist areas. It can also be done on land via buses or taxis. You can do this via an excursion booked with your cruise line or a DIY tour. If you choose to explore on your own, then you can take a taxi at the taxi stand at the end of the pier. The taxis charge one fixed price and the trick here is to go in a large group of at least 8 people to lower the cost per head. As is common in the Caribbean most taxi drivers double as tour guides, the same is true in St. Maarten. This drivers/guides will take you on a guided tour around the island starting from the Dutch sidean then to the French side stopping briefly at popular tourist attractions. The best thing about a DIY trip is that you can choose to alight at any stop that interests you and continue on your own with no questions asked. Just don’t lose track of time, lest your boat leaves you. On this tour, you will learn a lot of interesting history about the island and the humorous stories on how the two nations decided on where to divide the island. You will get to do a lot of sightseeing so have your cameras ready to capture those perfect shots of the beauty and wonder of the place. One should probably start the day with a level head, but this made hard when you visit one of the most popular places on the Dutch side, the Guava Berry Liquor Emporium. Rum is not the only reason to visit this emporium, but also to learn the colonial history of the town. To hear ancient tales of how the Rum was made in people’s houses from wild rare guava berries found on the island. The emporium also showcases and sells a variety of unique Caribbean spices. Once a tour of the emporium is done you are welcomed to sample various rum and guava berry liquors. You can actually get popular Tortuga Caribbean Rum Cake and more from Amazon. Once done at the Dutch side celebrate visiting two countries within just minutes as you cross the border over to the French side. Explore the beautiful mountainous side on the French’s turf and visit its capital of Marigot town. It is the busiest place on the French side. Here is where you will shop for all those chic French fashions and unique French souvenirs. And you should purpose to shop here if you fancy European designer brands, because the prices of items here are at times 40% cheaper than at European retail outlets. Visit the open market bazaar and peruse till you find what you are looking for, or that which catches your eye’s attention. Besides that, you can also try the famous French cuisine. Enjoy exquisitely made French-Caribbean cuisines including freshly made baguettes. Live the life of luxury, sophistication and pleasure while you wine and dine like a royal in this town. Only be ready to part with a small fortune when all is done. Besides shopping and eating, the next best thing to do while on the French side is to hike up the green hills in its background. One such hill just a few yards from Marigot’s busy center hosts one of St. Martin’s historical monuments, Fort Louis. Take the mountainside staircase up the steep hill to get to the fort at the top. It will all be worth it once you see the view of the island and its surrounding neighbors from the advantageous panoramic view afforded to you up there. Definitely carry a camera to capture all this. 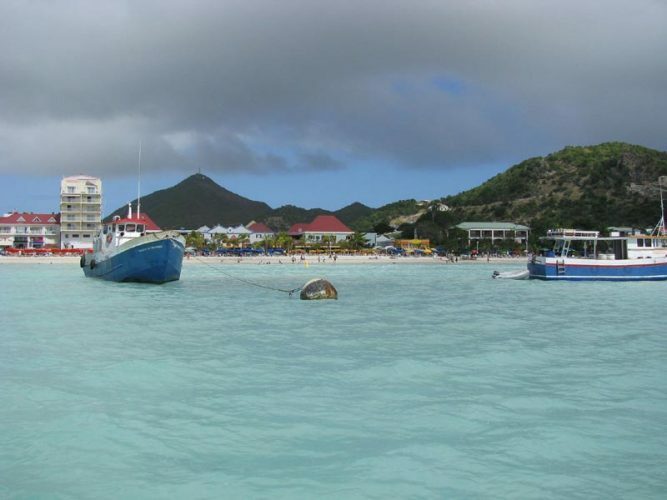 While still on the French side, visit the most popular beach on St. Maarten, Orient beach. The beach sure lives up to this praise and doesn’t disappoint. Graced with a long stretch of white powdery sand beach and crystal clear blue waters, Orient beach is one of the most beautiful beaches in the Caribbean. Grab a beach towel, umbrella or a sun lounger and enjoy a perfect beach day at this place. Lazy around under the clear blue skies and warm weather sipping on cold cocktails. However, being that this is a French beach, be ready to encounter naturalists in its optional clothing section. Visit the Loterie Farm found on one side of Pic Paradis. It is a beautiful resort dotted with beautiful wooden cabanas hidden among the trees. It features a large pool, restaurants and large picnic-play grounds. This is where you want to take a large group of friends or family for a fun hangout. There is fun for all ages offered by the zip line courses, hikes and boat trips offered here. It’s also a very beautiful place to have a wedding at. The zip line course at this farm dubbed the extreme fly zone shouldn’t be missed. It runs from top of Pic Paradis (the highest point on the island) to the farm below. For the energetic and adventurous individual, hiking in St. Maarten is a must do. Just above the Loterie farm are two observation decks found on top of the mountain at the magnificent Pic Paradis point. The highest point on St. Maarten. Take a hike through the forest and enjoy panoramic views of the surroundings including the neighboring island of Anguilla. You’ll need bug spray and sunscreen when visiting these Caribbean destinations. Speaking of panoramic views, check out the Flying Dutchman zip line course at the Rockland Estate which is located in historic Emilio Wilson Estate. Enjoy the rich history behind this old plantation estate. Then take a ride on the famous sky ride, a chairlift suspended from a flight cable hundreds of feet above the ground. 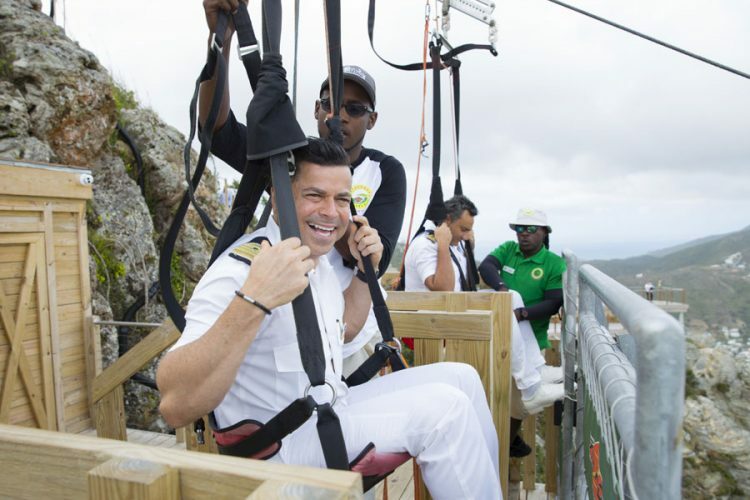 We posted about the opening of this new zip line shore excursion right here. This lift will take you on a relaxing and scenic ride up the mountain. Where you will receive a short orientation before getting strapped onto the zip line cable and beginning the 1050ft descent down the mountain. Enjoy the picturesque scenery of the vast blue waters, and the lush green countryside as you zoom your way down the mountain. Once the Flying Dutchman course is over, get onto yet another exhilarating ride on the schooner ride, a slide running down the rest of the mountain up to the farm. Grab a tube and hold on as you slide through the forest careening and bending at every curve to get to the bottom. Another way to see this island is on an ATV. Take a tour of the island on top of this powerful bikes, navigating the rugged terrain on dirt paths through the forest areas, and on the rugged coastlines. Enjoy the thrill of the challenge as you drive at full speed embracing the beauty of St Maarten. Have you secretly desired to scuba dive and have never had a chance to do so? Then don’t miss out on the opportunity to do so in Philipsburg, St. Maarten. Most cruise lines and local tour operators offer a snuba excursion for diving beginners and amateurs, where you are allowed to dive without a tank, but with an air pipe tethered to air tanks on the surface of the water. There are many snorkeling and diving spots around St. Martin which have clear warm waters that allow light to sip through making them perfect for this activity. Most of the snorkeling is done on Simpson Bay found on the Dutch side or Mullet Bay beach adjacent to Maho beach. Browse travel snorkel for your cruise vacation by clicking here. If you are a nature lover then you won’t want to miss the Butterfly Farm at St. Maarten tucked away amidst the mountains on the French side. The butterfly nature reserve hosts over 100 species of butterflies from everywhere in the world. Enjoy interacting with these beautiful creations as they flatter and lay kisses around you. You can book this activity as an excursion with your cruise ship or visit the place by taking a taxi there. The best time to visit is early in the morning when young butterflies emerge from their cocoons. 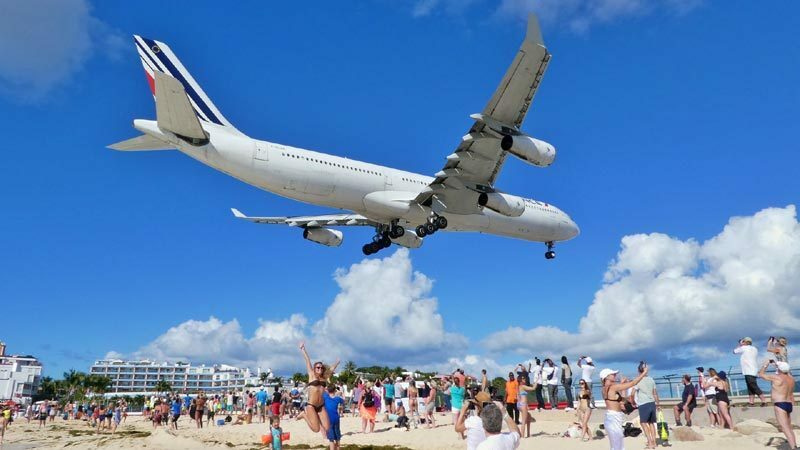 One of the most popular things to do in St. Maarten is to watch airplanes land at Princess Julia International airport. You might wonder why this is so, and well it’s for a valid reason. The airport is nestled between a mountain on one end and a beach on the other. Maho beach aligns perfectly with the runway at Princess Julia airport. Thus, it affords people the chance gaze at the belly of giant 747s as they fly extremely low over the beach to touch ground at the runway. That explains the strange photos you might have seen of planes flying at almost an arm’s length above people on a beach. That beach is Maho beach in St. Martin, make sure to stop by here before the end of your trip. Take some photos and cringe at the overwhelming feeling of getting sandblasted. Though airplane watching at Maho beach is an out of the world experience, it is not something that you want to experience for long. That’s why you should head on over to the adjacent Mullet Bay beach just nearby, which is sheltered from the noise and activities of the airport. It has a beautiful stretch of sand and clear waters that are perfect for snorkeling and other water sports. Get all your handy beach accessories from Amazon before your cruise. However, if you fancy more private and secluded beaches, you can charter a boat to the nearby island of Anguilla. Anguilla is endowed with virgin beaches that feature pristine white sandy stretches. It’s the best place to enjoy a perfect beach day. A boat transfer only takes 30 minutes to get to the island. You can book an excursion to Anguilla via your ship or local tour operators. St. Maarten as most other Caribbean destination experiences the tropical monsoon climate where it’s hot throughout the year. Temperature averages in the 80s and it’s hottest from July to September and cold in December to April. June to December is the rainy season on the island, and this is also the Hurricane season. Therefore, plan your trip to coincide with the weather that you prefer to avoid getting disappointed with your trip. If are yet to visit St. Maarten then you now have 15 reasons why you should. However, these reasons aren’t exhaustive. There are plenty other things to enjoy in this cruise destination including golfing, private yacht trips, culinary tours, and nature explorations. Kindly note that due to the devastating Hurricane Irma that hit the island in September 2017, a lot of the island was damaged and is still recovering. Therefore, some of the popular attractions you might want to see or activities you may want to engage in might not be available when you visit. With that said, however, you shouldn’t be discouraged from visiting the island as it has picked up its pieces pretty fast and its charm and beauty still holds. Besides they depend on your tourism as their number one economic activity which also helps them gain funds to rebuild. That’s all for St. Maarten for now. Enjoy your trip there. Happy Cruising.